Last month I covered Mint vs. Personal Capital, but I kept hearing my readers talk about another personal finance tool that I wasn’t as familiar with– YNAB. I kind of assumed it was just like Mint, another platform to track your expenses and do some basic long-term planning, and while in some ways it is, I’m really excited to talk about YNAB vs. Mint because of how different they actually are. First though, let’s take a second to talk about how important it is to know what is actually happening with your money– how much you’re bringing in and how much is going out. I see some millennials spending money like they’ve found some secret stash of it in their backyard, and then I hear those same ones complaining about their debt and how impossible retirement will be. Here's the big secret to starting on the path towards financial independence: SPEND LESS THAN YOU MAKE. Seriously, it's the foundation for how all of this works. Get your spending under control. Then, if you can add in additional income streams or increase what you already have through side hustles, raises, etc. – you'll put yourself on the path to being awesome with money quickly. YNAB and Mint are both financial tools that can help you live that “spend less than you make” principle, but is one better than the other? YNAB vs. Mint: which budgeting app is best for you? Mint has been the OG personal finance tool for many of my readers. It’s been around since 2006 and has over 10 million users, plus it’s owned by Intuit, who is well known for their TurboTax software. Mint functions around the premise that to see where you stand financially, you need to see everything in one place. This means to get the most out of Mint, you need to link all of your accounts, like checking and savings accounts, credit cards, mortgage, loans, investments, etc. You can track your spending, set reminders for bills, build a budget, see your credit score, and see what’s happening with your investments. You can sign-up for Mint here. YNAB, or You Need A Budget, has actually been around for longer than Mint, but it’s only recently that I’ve started seeing it pop up more in the “best budgeting tool” conversation. YNAB also appears to have a very loyal following, and I’ve heard many of my readers talk about how it’s changed their lives. That’s a pretty promising endorsement right there. Rule 1: Give every job a dollar. You take the amount of money coming into your accounts, which you will link after signing up, and allocate every dollar until you’re back down to $0… basically zero-based budgeting. Rule 2: Embrace your true expenses. This is setting goals to help you with large upcoming expenses, like holiday spending, an emergency fund, etc. You set an amount you want to reach and put a certain amount of money in each category. Rule 3: Roll with the punches. This means flexibility and being able to move money around if you overspend in an area. Spend less on groceries than you thought, then move that over to savings. Rule 4: Age your money. The idea here is that you aren’t spending everything the minute it goes into your account. Ideally, they’d like you to get to the point where you are spending what you earned last month– the goal being to get out of a paycheck to paycheck lifestyle. Start your 34-day free trial with YNAB here. The first difference you should know about these companies is that Mint is free, whereas YNAB is going to cost you. There is a 34-day free trial, and then it’s $6.99 a month, which is billed annually at $83.99. It's important to note that YNAB doesn't require your billing information upfront, which makes it a relatively easy choice to jump in on the free trial. With YNAB, after you sign up, you are immediately brought to your dashboard, which is basically a list of all possible budget items. Everything is set at $0, and once you start linking your accounts, you can start allocating money. Mint, being free, is an obvious choice for people wanting to aggregate all of their accounts, and signing up is just as easy as YNAB. It’s just an email address and password for both. After signing up, you will need to start linking your accounts before you can see anything else. YNAB vs. Mint, design wise? Both platforms have a clean, modern look, but there is something about YNAB that is a little less fussy. First of all, YNAB doesn’t have ads, and if you’re paying for a service you should, of course, expect it to be ad-free. With Mint, on the other hand, you have ads taking up nearly half of the screen, but you can X out of most of them. I’m big on design because when something is designed poorly it can make for a really awful user experience. Good design for me means an intuitive interface that serves its purpose. With that in mind, I think you can see the key difference between YNAB vs. Mint on their dashboard/overview pages. Your overview page on Mint shows your accounts, loans, bills, mortgage, spending, and credit score. At the top of the page, you can toggle between transactions, credit score, bills, budgets, goals, trends, investments, and ways to save. While I don’t have much experience with YNAB’s mobile platform, Mint recently updated theirs and it looks great. Your YNAB dashboard is clearly focused on your budget, and that’s the first thing you see when signing up. There is a bar on the left that will let you click between your budget, reports, and accounts, but budgeting is clearly their primary focus. When deciding on YNAB vs. Mint on a design basis, is one actually better here? I kind of like YNAB’s design better, but I think that’s because the design tells me exactly what I’m getting from the software. I suppose Mint does too, but I’m still not a huge fan of the ads. Which is better for budgeting? When talking about budgeting with YNAB vs. Mint, my readers have talked about how life-changing YNAB has been, and I get it now. Like I mentioned earlier, YNAB’s budgeting principle is to “give every dollar a job” or zero-based budgeting. This means that you take your entire paycheck and allocate every last penny of that money. You can put $400 towards groceries, $1500 for your mortgage, $1000 towards student loans, $400 towards savings, etc. The reason that zero-based budgeting works well for so many people is that it is a disciplined yet flexible approach to managing your money. It means that instead of saying “I’ll just save whatever is leftover at the end of the month” you set a savings amount from the very beginning. Mint does have budgeting tools, but they’re not front and center. It does learn your spending behavior the longer you use it and will create an auto budget for you, which you can then adjust as needed. Which is better for customer service? When it comes to customer service with YNAB vs. Mint, YNAB is clearly the front-runner. Mint essentially has zero customer service. They do have a support page, which is basically a collection of articles to help you with common issues, but that’s it. YNAB support is run through their homepage, and there is a comprehensive list of topics that are discussed in community forums, weekly Youtube videos, and they even have 300+ short podcast episodes to help you with different budgeting issues. If all of that doesn’t answer your question, you can email them directly. It’s important to remember here that with YNAB vs. Mint, you are paying for one and not the other, so it’s realistic to expect that the paid option has customer service while the free option wouldn’t. YNAB vs. Mint, how user-friendly are they? One of the things that I kept hearing about YNAB is that it can take a few months to really get a feel for the software. I think that’s because YNAB does more than just show you where you’re at financially, it teaches you how to budget too, and if you aren’t already familiar with zero-based budgeting, then it might take a little bit of getting used to. Mint is pretty user-friendly, but if you want to use all of its functions (investing, budgeting, goal setting) then it will take some time to set it all up to the way you want. I know a lot of people that really just use Mint for tracking their expenses and the free credit score check-in, and those are great as stand-alone personal finance tools. Which one will really help you create a better financial life? Personal finance is a long game. It’s not simply a case of setting yourself up on one of these platforms and expecting everything to be legit from there. When it comes to weighing up between YNAB vs. Mint and which is going to help you long term, then I think we need to go back to what each piece of software is really doing. YNAB is budgeting, plain and simple. It isn’t tracking your investments or doing any type of analysis. You can still set an investments category to put money towards, but that’s really the end of that. I bring investments up because setting money aside for your future is a key part of building a financial life that works for you. Mint does let you link brokerage accounts, your 401k, IRAs, and mutual funds, so Mint will show you where you’re at, but neither YNAB or Mint are going to give you as much detail as Personal Capital. Read more at Personal Capital Review – Free Money Tracking and Retirement Calculator. YNAB vs. Mint, is there a clear winner? Well, this really depends on what you want out of your financial planning tools. YNAB is hands down a much better tool for budgeting, and I’m excited to play around with it a little more and see how it’s going to help Coral and I with our monthly budget. Mint, on the other hand, offers you a good overall picture of your personal finance situation. There really doesn’t need to be a winner with YNAB vs. Mint because they are both helping you manage your money, and that’s the important thing. It’s also okay to use multiple tools for managing your money so there’s nothing stopping you from using both if you want. With YNAB’s free trial and Mint being free, you could always try out both for the duration of the trial and figure out which one you prefer. If you’re wondering whether or not YNAB is worth the cost, well that’s going to depend on how much you need help with budgeting. I’m willing to pay to find out because I’ve heard so many good things about it. 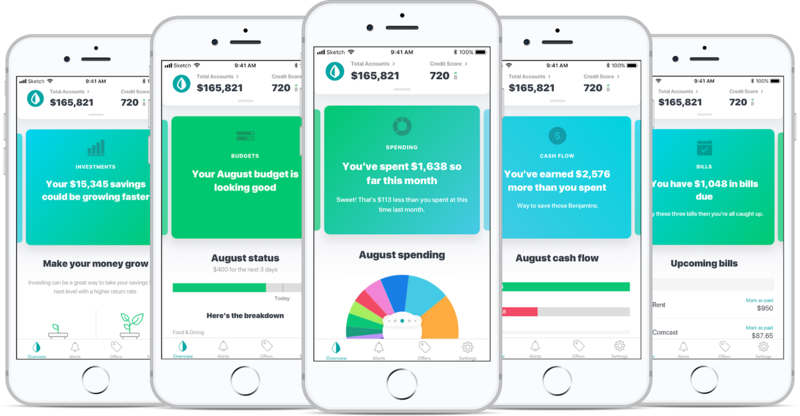 I also like how it teaches you to be proactive with your money whereas Mint has a more passive approach for basic users, which is just showing you where you’re at. Which one do you like better, YNAB vs. Mint? I am in the YNAB cult. 😂 it has changed our finances ans our marriage for the better. We rarely fight about money, we have been able to pay off a significant chunk of debt and we still have money left to play with. We are no longer drowning. I gladly pay the annual fee. That’s awesome! I meant cult in my email in the most loving way haha. It really is an awesome tool – now I see why everyone was so excited about it! What about “EveryDollar” from Dave Ramsey? Very easy and extremely mobile friendly. Free unless you want it attached to your bank accounts. I’ll do a review of that one eventually too. That’s probably #3 out of all the ones that people usually tell me about. EveryDollar is good for a simple, free app as long as you can get past the constant advertising to get you to upgrade or to try an “ELP” (endorsed local providers, which is a pretty meaningless term since I think the only prerequisite to becoming endorsed is paying the monthly fee). I love the goal setting in YNAB, which is why I kept it after the trial and switched away from EveryDollar. That’s awesome! I’m going to go ahead and do an Everydollar vs. Mint review as well. Every Dollar paid version will let you automatically download transactions except for any American Express accounts as DR doesn’t like AmEx. I stopped using it because of that. EveryDollar is $99 a year and has some annoying things about it so I’m dropping it. The “fund” option doesn’t work properly, some transactions from my bank don’t load, and most surprising of all (at least as of last year) you actually can’t change your email address in your account. That is the stupidest thing I’ve ever heard. So if there is important information they are giving to their customers you won’t know about it because they don’t have your current email address. I’m curious to know how they’d compare when income fluctuates per month? My husband works in car sales and his paycheck can fluctuate by a couple thousand dollars every month, and my side hustle also fluctuates, so I’ve found budgeting difficult. I’ve tried YNAB and wasn’t thoroughly impressed (but I also am not very familiar with zero-based budgeting), but Mint doesn’t have all the features I’d like it to have. Hmm I’ll talk to some readers in the M$M group and try to find out! Set your YNAB budget up so that your fixed, immediate expenses get funded first when money comes into. You can set goals so that you know if you are on track or not. When you have bigger checks, go down the list and fund future expenses. You can budget money for future months also. YNAB is great about having tutorials for situations like yours also. Their classes and videos are helpful. I’ve been using Quicken for a decade and considering it used to be owned by Intuit I suspect Mint is fairly similar. So far I haven’t found anything online that can match the horsepower of Quicken but if it isn’t an app/website it seems like people don’t even consider it in their comparisons anymore. I keep hearing about YNAB as well so I might give the free trial a go. How does it work if you have variable income or bonuses? I’m not sure how a zero-based budget works if many of the months are negative cash flow followed by big positive “catch up” periods. I’ve been using YNAB for two months and love it, learning curve aside. And I use Personal Capital to track net worth. I’ve read that Mint advertises financial products that may not be aligned with your goals (e.g., credit cards), which is why I’ve steered clear and don’t recommend it to others. Yeah they do have a bunch of ads in the program, but I just ignore them. I use Personal Capital too! First, both of these tools are great and if you are 100% into either of them then you are so far ahead of the pack that the differences hardly matter. For me, I use Mint. I focus on the big picture and use it to keep up with my total net worth. I also use the budgeting feature and track my spending. I don’t even notice the ads anymore. Mint helped me get to early retirement by focusing on saving and staying within my budget. Now that I’m retired I still use Mint to track my income, spending, and net worth. My favorite feature is the graph that tracks this month’s daily spending against last month’s – very helpful. I don’t think you can go wrong with either tool as long as you actually use it as designed. Ah that’s interesting! I actually use Personal Capital for the net worth side and Mint for the budgeting. I agree that you can’t go wrong with either one! I’m a diehard YNAB fan!! I’ll never use anything else. I used the baby steps in Dave Ramsey tobget out of debt, and YNAB for my budget. I tell everyone I know about it. Don’t use anything else!! Oh wow – usually DR’s followers use Everydollar. So many people love YNAB though, so they must be doing something right! I tried mint, every dollar, and and personal capital. Each time I would get all excited setting up budget and starting to track expense s and income. But each time I would get behind and slowly I would stop using it. My friend told my about YNAB so I thought I’d give a try (fully expecting to abandon it). It was almost an instant love. Something about the UI just clicked with me and I FREAKING love it. I started in January and haven’t missed categorizing a single transaction. I am definitely a member of the YNAB cult. I now tell friends to do Dave’s FPU and use YNAB. I still use Personal Capital to track net worth but man I like YNAB. I love YNAB! I have been using it for a few years. we started using it after taking one of Dave Ramsey classes. Although I don’t agree with everything Dave Ramsey says his basic philosophy is solid. We’ve been using YNAB for years. It solved the problem of my husband not knowing how much money (or debt, before we paid it off)) we had, and having to ask me if we could afford this or that. 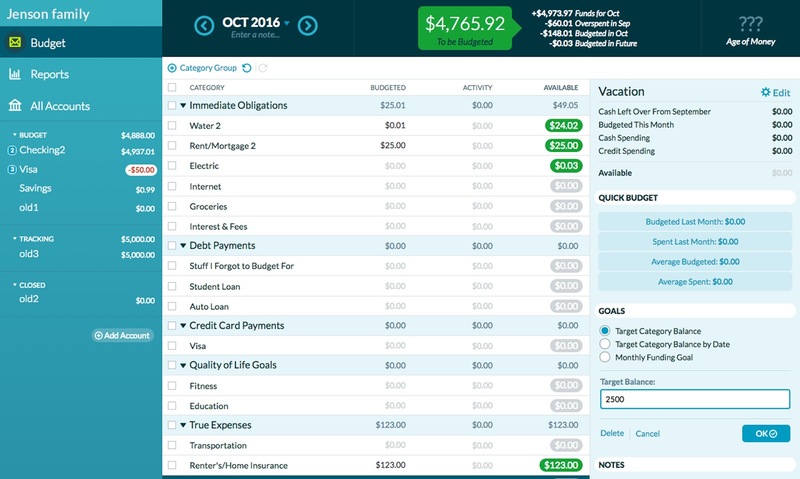 Now we can both see at a glance exactly what our finances look like. We both have the app on our phones. We used Dave Ramsey’s baby steps to get out of debt while using YNAB to budget what our money needed to do. It is so easy now that we’ve customized YNAB for our lives to sit down and budget each month. The best part is that we are budgeted one month ahead, so anything earned in November is budgeted for December. All our regular bills are automated and we know the money is there to pay them. I love YNAB’s ability to manually enter every transaction. It forces me to analyze my spending item by item and it creates a little emotional pain as they add up. It’s definitely not a perfect personal finance solution but it helps me sleep a lot better at night. Also the goal feature really helps with budgeting for expenses that might not happen every month, especially that annual subscription fee.